This is my first Halloween project of the 2015 Halloween Season. BOO TO YOU!! I got out 3 sprays for this background and some 140lb. cold press watercolor paper and went outside to an area I use to spray in, in good weather. (Still sunny and hot here) A dylusions Squeezed Orange, a Heidi Swapp Color Shine Chartreuse, and a Tsukineko Java Walnut Ink. No matter how I adjusted my photo program I use to save my pics I could not get the sky behind the Boo! to look orange like in real time. Same with those little rhinestones 2 of them are orange. On with the show--After I dried the background I tore my back ground piece and edged it with a Stampin' Up Metallic gold marker. Some time or a tuther I had picked up some Penny Black dies Boo Crew and Haunted Hollow, the bats are from the first one and the house and fence are from the second. Also, I used a studio G stamp and rhinestones for the Boo! and rhinestones in the top left corner. The fence was die cut out of a piece of scrap Stampin' Up So Saffron card stock, the house from Stampin' Up black card stock backed with a piece of Stampin' Up Pumpkin Pie card stock. I gave the fence a light sponge of Vintage Photo Distress Ink, and the sparkle in the windows is a Stardust Gelly Roll pen, as the eyes on the bats is with a White Gelly Roll pen. 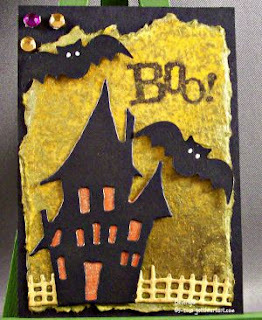 Baddy Bing Baddy Bang--a very cute ATC. Just wish that sparkly shimmer would have come through on the photo with the true colors. Grab your Sprays and whip up an ATC and click over and enter your little project of goodness at Wicked Wednesday, there's a prize to be had. Who knows you could be the winner. That is one super ATC. Love all the detail you put in. Boo to you as well :) What a top holiday to have. Wish we had something like this here, it's too much fun. I just love this, thanks for playing with us at Wicked Wednesday!